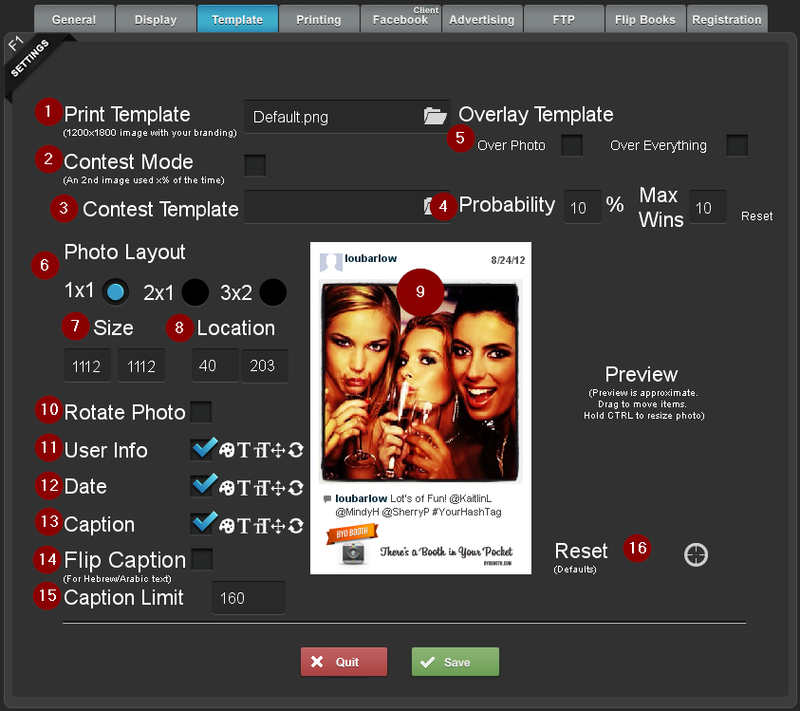 Navigate to the 1200x1800 PNG template you want to use for a selected (winning) photo. Set the probability of a winning photo. At 10% each photo has a 1 in 10 chance to win. You can set the max number of wins so when the system hits the limit of wins contest mode will shut off. If you want your template to be overlayed on top of the photo or on top of everything instead of the photo placed on top of the template, you will need to make your template a transparent png, with a hole cut out for where the photo will show through. This can be used to create more interesting layouts. This places 2 photos on a single page that can be cut in half to create more Polaroid looking prints. The default functionality of this layout will be to place 2 different photos as the arrive into the layout, but by checking Duplicate (A) it will instead use the same photo on each side of the layout, essentially creating 2 copies once cut. This places 6 small 1.5"x1.5" photos onto one print and can be used to create Instagram magnets or buttons. This shows the user's username and photo. You can change the font, size, color and rotation. This shows the date of the photo. You can change the font, size, color and rotation. This shows the caption of the photo. You can change the font, size, color and rotation. This will reset the layout to the default values. Note: The design tools and resulting preview are approximations. You may have to tweak the values once you see the actual prints.